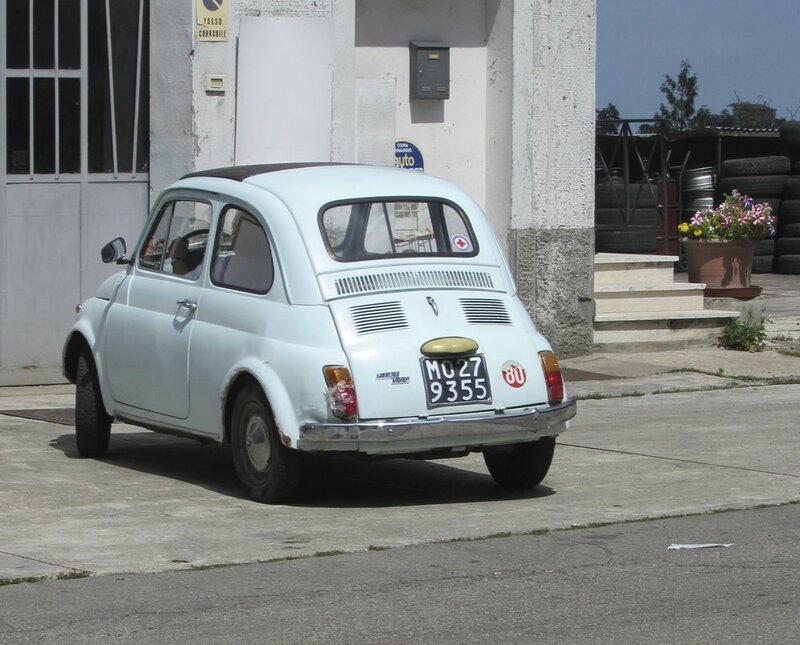 These are a few of our favorite places that we've found on the back roads of Italy... Buon viaggio! Osteria La Solita Zuppa was a great find in tiny Chiusi, known well for its great Etruscan museum and tombs. “La Solita Zuppa” literally means “the usual soup”, though we found the place to be anything but mediocre. Soup is, of course, a main staple here and has its own special section on the menu. There are about a dozen soups listed, but only a few are available each day (this is good, it means they are only making things that are seasonal and fresh — beware any place with too long a menu). We opted for a traditional Tuscan onion soup (insanely delicious) and an artichoke and mint soup (very interesting, a good pair with the onion). We followed this up with a plate of gnudi (literally means naked, as in naked pasta), a dish that is just the ‘inside’ of a ravioli — little, oval shaped forms of spinach, egg and ricotta, in a butter and sage sauce. We also had the lasagna. The soups come served piping hot in little ceramic dishes, fresh out of the wood oven. The smell of wood smoke permeates the restaurant, it’s quite powerful and comforting on a winter’s day. We finished up with a berry torte and a couple of espressi, which were served in the most elaborate coffee service tray we’ve ever seen. At the end of the meal we indulged ourselves with a shot of house-made cinnamon liqueur (called ‘canella’), made by owner Andrea’s wife. We tried to buy a bottle but they didn’t have enough to sell, though Andrea let us take a picture of his wife’s recipe book before we left. Andrea has great English and is extremely welcoming; we’d highly recommend this cute and friendly restaurant and the Etruscan sites nearby. This small family-run restaurant is located right on the main street, Via Soccini 61. There are no menus; the staff just tells you what is available, and in general English is not spoken here. There is a sandwich board outside the restaurant with a list of what’s available that day, so you can read up before you go in. This is a very casual, very neighborhood restaurant that has a real grandmother’s-kitchen feel to it (which we loved). Unlabeled bottles of red house wine are on each table as you walk in; just pour yourself a glass when you sit down. Generally they offer a few types of pasta and you can choose a sauce; ask which pastas are handmade. The day we were there the pici was handmade so we had that with garlic sauce (all’aglione — this time unusually also with tomato), and a wonderful ribollita. For a second course we had roasted chunks of turkey in a gorgonzola sauce, and some chicory sautéed in garlic. We decided to spring for dessert and asked what was best; we were told that an apricot tart had just been made by ‘nonna’ (grandmother) and was still warm from the oven, so we had to have that, of course. All was delicious and we loved the family/friend atmosphere here. Reservations are necessary as this is one of the only restaurants in town and it is very popular with locals. Built alongside the tower and in the same period, Modena’s Romaneque cathedral is the perfect example of ornate medieval architecture. The exterior is full of sculpture, bas-relief stone carvings, and statuary (including some not-very-pious imagery). The doorways are adorned with hundreds of bible scenes, for the benefit of the masses who could not read – the medieval church was not a big supporter of general public literacy. The Grand Piazza next to the cathedral, one of the biggest in Italy, has a large marble stone tucked away in one corner: This is the “Preda Ringadora”, and was used alternatively as a speaking platform and a place to publicly punish and humiliate wrongdoers. This B&B has one of the most memorable, and most romantic, views of any place we’ve ever stayed. Host Francesca is incredibly nice and speaks English, German, French, and of course Italian. Ask for a room with a balcony and lake-side view; it’s an absolutely incredible place to sit and have a glass of wine. There is a parking space available on request. Francesca serves breakfast each day on the patio, whose view is also stunning. If you like, Francesca will arrange for you to head over to have dinner on Isola Pescatori. Her friend Paolo runs a restaurant there, he comes to the shore to collect you in his boat and returns you after dinner. The rooms are clean and comfortable but this place is all about the view! Ristorante La Foresta is also a hotel , run by a very nice family who love what they do. The restaurant has a beautiful dining room with fantastic views of the lake. They specialize in lake fish, of course, but they also have a special sausage, a salami made on Montisola, seen here drying outside the restaurant in their own box with their lake catch. Similar drying boxes to these can be seen all over the island, it seems like everyone has their own stash. Pastas are handmade here; this is a small restaurant so they have a limited menu, and especially in off season there can be variances to what is available, just ask—they’re very nice here and will guide you to what’s best. We had a handmade pasta with lake fish followed by fried lake fish with pomegranate and grilled vegetables. Regardless of what time of day you are here, take a moment and look around; the views of the lake right outside the restaurant are just stunning at all times of day. This agriturismo is located in the 11th Century abbey at Badia a Coltibuono, nestled at the top of one of the many Chianti hills. The rooms are beautiful, many with views over the gorgeous manicured formal gardens. The hotel itself feels like a museum, with antique furniture and artwork decorating the large hallways. Breakfast is provided in the morning in a downstairs salon, a pretty typical Italian-style breakfast with fruit, cold cuts, cakes and coffee. There is a large drawing room where free wifi is available; the room incredibly beautiful, with access to the formal gardens and outdoor tables just outside. Each day there are guided tours of the grounds and gardens, for a few Euro you can get a complete history during the hour or so long walk. Below the gardens, in the warmer months, there is a large in-ground pool for guests’ use. Driving up to the abbey, there is a store where you can taste and purchase items of the abbey’s production. On site there is an excellent restaurant, which serves the abbey’s excellent wines. This hotel is a bit pricey but we found it absolutely worth the money. The rooms are very comfortable and incredibly beautiful, the restaurant is excellent, and remoteness of the location makes it a very romantic place to watch the sunset, listen to birds, and stargaze. This bar is unassuming looking from the outside but is well worth a stop, if only to see the incredible whimsical wooden artworks inside. We stopped here on our way to Monteriggioni — upon exiting the highway, the bar is just right after the traffic circle before you take the turn to Monteriggioni. Parking can be found directly across the street. We stopped in at 8:30 in the morning for coffee and asked for two cappuccini, and the barrista expressed surprise, which made us smile. We realized after a minute that the reason he was surprised was that everyone else around us was getting an espresso and a grappa — at 8:30 am! We wanted to try it but had a lot of things to see that day so we decided to forego. However, this is clearly the place to go if you are looking for a good stiff drink in the morning. We returned to the bar a few hours later after visiting Monteriggioni for another shot of coffee, and to pick up a couple of panini to take with us. The bar has a very well-stocked deli case attached and they made us a couple of delicious panini on the crustiest, crunchiest bread. They also have sit-down lunches and dinners, though we didn’t try them — but we highly recommend you stop here and grab yourself a panini, and while you wait check out the elaborate, beautiful and often funny wooden artworks. This stunning four towered castle is just outside Siena. It offers two rooms: The Blue Room and the Tower Room. The Tower room is undoubtedly the one you want; you get to spend your nights in one of the four towers of the castle with expansive views of the countryside and Siena. The castle is owned by a family that currently lives there; it has a homey, cozy feel, while still being magical and elegant. We loved the Tower Room; the view was incredible and it was very memorable. One morning it was quite foggy outside; we opened the windows and let the fog roll in around us because we were so high up we were level with the fog, it was incredible to feel like you were becoming part of a cloud. Breakfast is served in a small dining room off the large living room. There are no restaurants within walking distance so you have to plan on driving to Siena or into the countryside to get dinner. We took advantage of the gorgeous setting and bought ourselves bread, cheese, salami, oil, veg, fruit, chocolate and wine and had a couple of romantic, lazy lunches in the garden on the castle grounds. When you’re paying for a location like this, we like to take advantage of it. Ask the family to give you a short tour of the grounds; if you’re lucky you may get to see the private chapel, or inside one of the other (unoccupied) towers. Excavated in 1951, this Roman theater is a relatively new sight in Volterra. Previous to its excavation it was used as a garbage dump–townspeople tossed their rubbish over the wall; in short order it covered the ruins. Today, however, we have the pleasure of seeing the entire forum, though it is fenced in, with no access. The best view is from the town wall, looking down into the site, but it’s worth it to walk the perimeter. West of the beautiful and famous Lake Bracciano lies a great deal of sparsely populated, rural landscape. Nestled in this acreage is Locanda Cicale, a very quiet place (aside from the goats and chickens that live in the field behind), which has four rooms above a small but excellent restaurant. Arrive hungry, and save your appetite for, among other things, the biggest antipasto plate you’ll probably ever see. The restaurant is run by two friends, Cinzia and Mariella, who started the business together because they love local, traditional cuisine. It’s kind of like eating at your grandmother’s house, if your grandmother can really, really cook. Frequently we are the only people staying and eating here, but we are always made to feel very welcome. Desserts are particularly amazing here; we had a great bavarese. Breakfast is served in the restaurant in the morning, at a time of your choosing between 8 and 9:30am. There is a large balcony on the east side of the building; ask for one of the rooms attached to that if you would like to sit up there and have a glass of wine and watch the sunset before dinner. The rooms are small but comfortable enough, and very affordable. Drive to FCO airport: 55-70 minutes. This restaurant on Montisola is located on the left, down a little walkway, just as you walk into Sensole from Pescheria Maraglio, which has stunning views. The restaurant has waterfront seating, the view is hard to beat. We were there in the off season when there were only a few other tables occupied; in the summer this place is hopping and a reservation is a must. The restaurant serves typical food of the area and specializes in lake fish, like this antipasti of mixed lake fish, (with a bit of Montisola salame in there as well. Many pastas are handmade, be sure to ask what’s fresh. I enjoyed this simple spicy tomato sauce with handmade spaghetti. They told us tiramisu was the house specialty and we were glad we ordered it. If you have extra scraps of food of any type they will be gratefully and enthusiastically received by the literally dozens of cats who live in a cat sanctuary down the road from the restaurant, they even get their own sign. The Borromeo family was one of the richest and most influential families in Italy since the 14th century; they had a significant seat of power in the Lago Maggiore area. In 1624 Cardinal Federico Borromeo, the Archbishop of Milan, commissioned a colossus to depict his ancestor San Carlo, another cardinal and archbishop. Towering almost 115 feet at the top of the hill above Arona (Carlo’s home town), the bronze statue wsa completed in 1698; it later became a model for the construction of the Statue of Liberty. Visitors can climb up inside the colossus and peer out of Carlo’s eyes, seeing what he sees in an impressive vista. This stunning, excellent restaurant housed in a renovated monastery is just outside the town of Dozza, a 5 minute drive, and is also the site of a very upscale hotel resort. It is well worth the long walk or short drive to eat here, the food is expensive but impeccable. There is an upstairs dining room that is very formal in design, full formal service….if you are looking for an upscale dining experience with all the accoutrements this is for you. We were pleased, however, to find that the dining room is not open for lunch, but that the same menu is served downstairs in the cantina, a centuries-old wine cellar that still serves as the wine cellar for the restaurant, but today also holds a few tables for lunch guests. The room is circular, with an arched ceiling, and that gives is some very unusual sound properties — certain points in the room correlate to others, so if you are in the right position, someone across the room whispering will sound as if they are right in your ear. (At first this is disturbing, but then it can become a bit of a fun game). The food here is traditional, but with a distinctly modern twist. As mentioned, it is a bit pricey but we found it to be well worth it. Service was very friendly; due to the smallness of the cantina the server can’t hover over you, which is the way we like it. We started with a soft boiled egg with a light breadcrumb crispy crust, cooked perfectly with the most amazing orange colored yolk, on a bed of wilted spinach and topped with white truffle. We could have eaten just two more of those and been happy, but we were glad we proceeded on to the next course, which was a turbot fillet with thinly sliced grilled porcini mushrooms with potato-ribbon-wrapped scampi; and a loin of pork cooked in milk with a delicious sauce of raisins and pine nuts. We gluttonously finished the meal with a robiola cheese tart with a sauce of berries and red wine. A very memorable and incredibly delicious meal in a very romantic setting, this is a restaurant not to be missed. Reservations are a very good idea, as the cantina has very limited tables. On the eastern outskirts of town, across from a “Super A&O” supermarket, is this hip little gelateria. This is artisanal food at its best: Homemade in the back room – you can see them working through big panes of glass – the gelato here is made with all fresh, seasonal, and organic (“biologico”) ingredients. Though it’s a hip, modern place that contrasts with the ancient sights of the city, it exemplifies what’s best about eating local. Not to be confused with Lucignano d’Asso, further south, this only slightly larger city of Lucignano is a very well-preserved medieval hill castle. Like many such towns in strategic positions, this one was heavily fought over for centuries, claimed variously by Siena, Perugia, Arezzo, and Florence. The main point of interest here is the design of the town itself – the streets are laid out in concentric ellipses, each interior one higher up than the one surrounding it, just like a tiered cake. The top part is the oldest, the fortress dating from the 13th century. Time spent in Lucignano is time spent in Italy. Immerse yourself in this village of artisans and craftsmen of all kinds, especially cloth-makers andwood-workers; visit the museum in the 16th century Town Hall, and the several ancient churches at the top of the town; find great food made within just a few miles of the town (sometimes within just a few yards!). This very small leather shop is right on the main street. Everything is handmade by leather craftsman Valerio Truffelli , who stamps each piece with his ‘logo’, as he called it, a ‘fantastic creature’ he created to be his signature. Valerio has purses, bags, books, wallets, belts, and many other items, which can be slightly pricey but that is because they are handmade, and they are meant to last for a lifetime. Matt bought a wallet in 2008; it’s 2013 now and it’s just starting to get soft, in a nice way. Valerio also makes smaller, more affordable items like bracelets and keychains. We wanted keychain fobs with our initials “M” and “Z”. There was no “Z” so Valerio made one for us (image on right). Because Valerio is making everything himself, if you have a request for a specialty item it is possible to arrange that with him, for a gift or a keepsake that is incredibly personal and will last forever. A small knitting shop, right on the main street of Buonconvento. Owner Susanna Gorelli has this small shop, which has scarves, bags, jackets and dresses for sale. But the real reason to come here are the gorgeous hand knit items–scarves or every variety, gloves, hats, sweaters, all hand knit by the women who work here. They make a very unusual scarf that is in a tube shape, knitted with the finest thin spun wool that looks like a spider web. The scarves are so thin, they are nearly transparent, but when worn they actually are quite warm. Zen has an assortment of these in different colors, someone once commented that the light green one looked just like sea foam. Be sure to look for the “Susy” label — the store sells all kinds of knit items, but only the ones labeled “Susy” are handmade here. This B&B is located just outside Parma, on a working dairy farm that makes Parmigiano Reggiano cheese. The rooms are cute and immaculate. There is a great little farm store here where you can buy cheese, lambrusco, and jams from the farm. The breakfast is hearty (click here to learn about Italian breakfast) and features many products from the farm and other local products. Lola and Cinzia are gracious and kind hosts who will gladly help you find good restaurants in Parma. This is a once in a lifetime chance to spend a few days on a working dairy farm; expect the sights, sounds and smells that would come along with that. We loved the rural, peaceful location, the opportunity to learn more about the cheese, and the closeness to Parma. Cooking lessons can also be booked, as well as guided tours of the farm. This charming hotel is located within the walls of the Castle of Rivalta. Rooms are snug and cozy and the beds are very comfortable. The Castle is still occupied but large sections are open to the public for visiting. Best of all, one of the best restaurants in Emilia Romagna can be found here: Antica Locanda del Falco. There are a few little stores (selling wine, oil, cheese, salumi, and crafts) within the castle walls, but they are only open on weekends and festivals. There is also a small wax museum here. In our opinion it’s worth it to stay at San Martino just to eat at Locanda del Falco. Attached to the restaurant building of this excellent farm-to-table restaurant is their beautiful shop in which can be bought all the products from the farm: cheese, salumi, jams, honey, vinegar, as well as all of the wine and liquori that they make there. Located just behind the circular piazza that is an ancient Roman Amphitheatre, this Osteria had been serving food since 1860. The very large dining room is actually a converted stable; unless it’s summer, we don’t think you would need to make a reservation. The Osteria prides itself on serving typical Lucchese cuisine, and everything on the menu is made from scratch. One Lucchese specialty offered is ‘castagnaccio’, a dense cake made of chestnut flour topped with pine nuts, and served with a scoop of ricotta. We saw a few tables of single elderly Lucchese gentlemen who had come in specifically to enjoy this delicacy; it was heavy, almost savory rather than sweet, with a very strong chestnut and rosemary flavor. For both food and atmosphere, this is *the* place to go in Lucca for typical cuisine. We could hardly believe how affordable this castle was. Dating from the 10th century, the castle of Valenzano is set up in the hills on its own. Much of the castle was built in the 18th century, and the castle and grounds are very impressive. We had a room on the top floor that overlooked the valley. The room was quite large, and comfortably furnished with a four poster bed. The bathroom was gigantic, larger than some of the bedrooms of B&Bs we’ve stayed in. The castle is quite remote, at the top of a hill up a long, winding, tree-lined driveway. There is a very nice restaurant located at the Castle, so you can sightsee during the day, and return in the afternoon to spend time walking the grounds before a lovely dinner. Le Forchette can be found right along the town wall overlooking the valley. The restaurant is tiny so a reservation is recommended. The atmosphere is warm and friendly and the food was well prepared. We had a very unusual lasagna with artichoke and pecorino, the noodles were crunchy and wrapped up in little packages. We also had a very good house made tagliatelle with rabbit. Dessert was unforgettable, a soft, melty cheesecake that collapsed on the plate (in a good way). We were a little distracted while here, as the cutest kid in the world was at the table next to us, so I’m afraid we spent a lot of time “oohing” and “aahing” over the toddler and not enough time paying attention to our plates. (We didn’t get a pic of the kid – we were afraid of looking like weirdos.) We’ll return to try it again; the place was filled with locals and the service was very friendly and welcoming. Right next to the door of the church of San Galgano is a small door to the right, which is a very small herbalist’s shop. This is the kind of shop Zen drives hours to get to. There are liqueurs of all types in here, including rhubarb, rosemary, and eucalyptus, to name just a few. They also have vacuum-packed packages of herbs of all types (intended to be used as teas) for all kinds of maladies. There are soaps, creams, shampoo and other toiletries, all made by the monks of San Galgano. There are also grains like farro, and some other nonperishable edibles. In shops like these you will find things you can’t find anywhere else, made by monks from the order. Make sure you read the label to be sure you are getting an item made by the local monks; shops like these often carry other monastic products as well. On a small street in Montepulciano you will find this copper artisan. Cesare Mazzetti learned the trade from his father, who learned it from his father. The store is a treasure trove of handmade copper pans, distilleries, plates, clocks, oil cruets…. and so much more. Immediately next door to the store is a small museum, which displays works by Mazzetti’s family and other pieces. This is a great chance to meet a living, working artist; support the artist; and find great gifts and souvenirs to bring home. For chefs, this is a ‘must stop’, as acquiring handmade copper cookware is a cook’s dream. We came upon Corte di Ca’ Bosco by happenstance. We were booked in another place, and when we arrived they had completely forgotten our booking!! We had just flown in that day, were exhausted, filthy and ready for a shower and a nap, and pretty stressed when we realized that we now needed to find accommodation and dinner at 6pm. Using our smartphone we booked this place on chance. Twenty minutes later we arrived, we were greeted warmly by Andrea (even though he had no idea who we were — he had not checked his email since we booked). He set immediately to getting our room in order, as we sat and decompressed at one of their outdoor picnic tables and drank a bottle of wine. A few minutes later Mirella greeted us to show us the room, for which we were immensely grateful. Our room was immaculate, had a tea service and a small fridge, and best of all, a large, private terrace. From this terrace we spent three glorious nights watching the sunset from the open windows, in total privacy while we sipped on prosecco and waited to go downstairs to dinner (Ca’ Bosco houses an excellent restaurant). This is listed as a ‘destination restaurant’ for us because it’s a very local-approved, very low key, inexpensive, traditional place. The decor is outdated, the toilets are old-fashioned holes with ceramic feet, and when you drive up, it feels like you are driving up to an old American Legion hall. That said, they make everything by hand, and you have the distinct feeling that you are eating in your grandmother’s kitchen, if your grandmother lived in Emilia Romagna. There are only two or three items for each course, and there are no menus, so they just come to the table and tell you what they have. If you order the antipasti plate of local salumi and parmigiano reggiano, be prepared to receive a gigantic platter–the first time we saw this Zen told Matt not to embarrass us by taking too much off the plate, thinking it was fit for more than one table. We were both shocked when we found that that entire platter was just meant for us! Because it’s a small restaurant, and everything is made by hand, plan to spend some time in between courses. The house lambrusco (local, fizzy, chilled red wine) is excellent and comes in an unmarked wine bottle. They always offer a ‘tris’ or ‘bis’ of pasta, meaning instead of having just one style of pasta, you can order two or all three they have that day (in tasting portions). Try to save room for the meat course (secondi), as many of them are local cuts roasted in the wood oven. After dinner, be sure to ask for the nocino, they usually have one that is made in house, in an unmarked bottle of course. Prices here are low, so don’t worry that you can’t see prices on the (nonexistent) menu. Giovanna is an incredibly warm and lovely host who treats you like family. Best to bring cash to pay as credit card reader may not be available. They will not bring a bill to your table; you need to go up to the till to pay when you are ready to leave. They will seriously sit there after the entire restaurant has evacuated, patiently waiting for you to pay (we, of course, learned this the hard way, as we spent 45 minutes waiting for a bill, only to discover that they were politely waiting for us to pay). A lovely restaurant for a truly authentic, old world experience.